Successfully Added Anonsuo Bluetooth Speaker And Nightlight - 2x5 Watt, 1500 Lumen, BT 4.0, CSR 4.0 Chipset, LED Lamp, Touch Control to your Shopping Cart. Bluetooth 4.0 for a strong stable wireless connection from up to 10 meters away. CSR 4.0 chipset and stereo 5 Watt speakers deliver awesome audio quality. 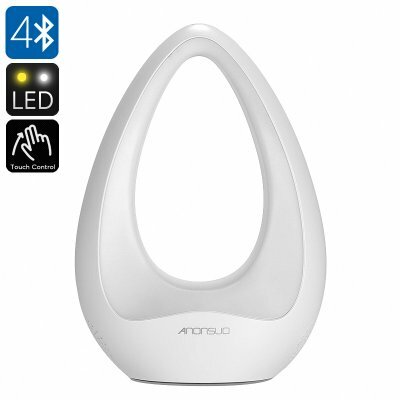 Touch control volume and lamp letting you adjust the mood in any room. The Anonsuo A Bluetooth speaker and lamp has a unique stylish design that was inspired by Guangzhou famous landmark, the Liede Bridge. This bridge is at the heart of the city spanning the Pearl River to connect the north and south of Guangzhou together. It's iconic form inspired the creators of the Anonsuo A to deliver an awesome looking product that is part cool gadget part sculpture. With CSR 4.0 chipset the 2x5 Watt stereo speakers pack a punch when it comes to audio quality. The full bodied sound has a good range producing an audio quality that's enjoyable to listen to. Having touch controls on the left and right side let you adjust the volume or lamp brightness at a simple touch. This speaker is equipped with Bluetooth 4.0 offers a strong and stable wireless connection from up to 10 meters away. It is quick and easy to sync your phone, tablet PC or other devices. For gadgets, without Bluetooth functionality, you can use the Aux in port for a wired connection. An ideal night light or interesting conversation starter for your desk or home the Anonsuo Bluetooth speaker and lamp sets the mood in any room. This Bluetooth speaker and lamp comes with 12 months warranty, brought to you by the leader in electronic devices as well as wholesale speakers and LED lamps..